While not getting pregnant after an IVF cycle can be heartbreaking, getting pregnant and then losing it can be much worse. This happens either when the patient miscarries; or when she has an ectopic pregnancy. While there is quite a lot of information about miscarriages after IVF, an ectopic pregnancy after IVF is something which most patients are completely unprepared for. It's not common, and happens in about 1-2 % of IVF cycles, but when it occurs, it can be devastating. The biggest tragedy is when the doctor fails to think of the possibility of an ectopic, as a result of which it grows and can even rupture, resulting in a life-threatening emergency. This is why it's important to monitor IVF pregnancies carefully, because an ectopic can easily be treated with medical therapy, provided the diagnosis is made in a timely fashion. 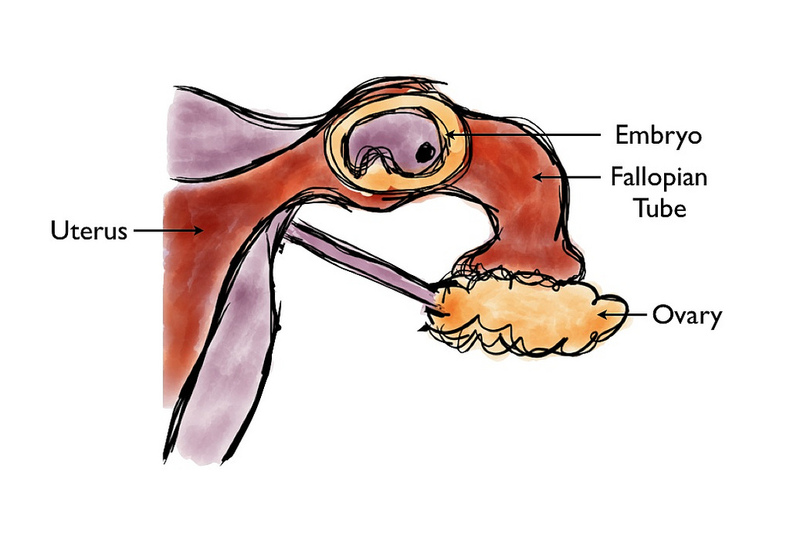 What most patients cannot understand is how the embryo lands up in the tube when the doctor transferred it into the uterine cavity . How could the embryo travel backwards into the tube ? After all, it cannot propel itself ! Did it happen because she did something wrong ? Was it because of excessive physical activity that the embryo got dislodged and was pushed from the cavity into the fallopian tube because of undue exertion ? Or was it because the doctor did not do a good job during the embryo transfer ? Here are some questions which a patient who had an ectopic after IVF asked me. 1. Can we achieve better precision for transfer next time to ensure the implantation occurs within the uterus at a desired location ? No - once the embryo is in the uterus, we have no control over where it will make contact with the uterine lining. We can't stop it from moving out into the tubes because we cannot stop the reverse peristaltic uterine contractions after the transfer is over. 3. Also, can we moderate the speed with which the embryos are transferred into the uterus? 4. My guess is that the embryo travelled a greater distance than it was supposed to . I wish it were so simple ! While the transfer is a simple mechanical procedure implantation is a far more complex biological process which we cannot influence. What can you do differently in your next IVF cycle to reduce the risk of recurrence if you end up with an ectopic after IVF treatment ? One option is to clip the tubes at the cornual end by doing an operative laparoscopy. This will prevent the embryo from moving into the tubes after the transfer, but will prevent you from getting pregnant in your own bedroom. Doctors have tried using muscle relaxants ( such as calcium anatagonists like Nifedipine) to suppress the uterine contractions after the transfer, but we don't know if this works or not. Patients can feel quite guilty when they have an ectopic, because they blame themselves quite needlessly. They feel that they have killed their embryo, and this can often be the last straw which breaks their spirit. Many refuse to repeat any further treatment after having an ectopic. However, rather than looking at the glass as half empty, the fact that you got pregnant ( even though it was in the tube rather than the uterus) means your chances of having a healthy intrauterine pregnancy are excellent. Hi! I had an chemical pregnancy, followed by an ectopic. The first time we tried 2 months. The second, the first month trying I became pregnant with the ectopic. I insisted it was ectopic and was discovered in the 6th week. My hgc was already dropping slowly, but I had methotrexate because I was scared of a rupture. 5 months later I had a HSG that showed my right tube partially blocked and my left (with the ectopic) clear. Two doctors said to try again and if it is ectopic, to do a laparoscopy. I would like an opinion on the way to go. If it is ectopic, I would prefer to go to IVF, but what is the best way? To remove the tubes or to seal them? What would give me the best chance to conceive? Yes, the risk of ectopic is increased, but you do also have a chance of having an intrauterine pregnancy !